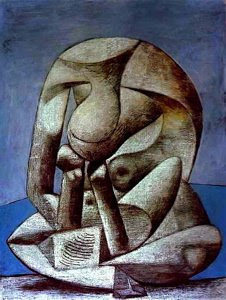 Like the figure above in Pablo Picasso’s Young Girl Reading a Book on the Beach, many soon will be dipping into their summer reading. Therefore, as the spring semester of classes has now concluded and many have begun thinking of books for the upcoming months, I thought this might be a good time to remind everyone each issue of Valparaiso Poetry Review contains a “Recent and Recommended Books” page for suggestions of poetry collections and volumes containing prose about poets or poetics. Below readers will find those books that were listed with the current Spring/Summer 2010 issue (Volume XI, Number 2). Perhaps some of them will provide apt suggestions for addition to your summer reading. Readers also are invited to visit the archived lists of Recent and Recommended Books from past issues of Valparaiso Poetry Review for hundreds of other suggested readings. Valparaiso Poetry Review also welcomes for consideration submissions of reviews or essays of critical analysis concerning any of the listed books. Those interested in submitting reviews should examine the VPR submission guidelines page. Oh, what a marvelously rich list -- a mini library all its own -- and I'm pleased to say I have at least some of these collections.